Abstract: A new method named divided-pulse amplification has been described which can be used for amplifying ultrashort pulses to high energies while avoiding excessive nonlinear phase shifts. Particularly for longer pulse durations in the picosecond domain, the method appears to have some advantages over the common method of chirped-pulse amplification. A common problem associated with the amplification of ultrashort pulses to high pulse energies is that the high peak powers lead to excessive nonlinear phase shifts and thus to spectral broadening and distortion of pulses. By now, the technique of chirped-pulse amplification has become a well-known solution: one dispersively stretches the pulses, amplifies the stretched pulses (having a low peak power), and recompresses them in a dispersive compressor. This technique, which is often used in high-energy femtosecond sources, is unfortunately not convenient for picosecond pulses, because these would require impractical amounts of dispersion in the stretcher and compressor. A new paper (Zhou et al., see above) from the group of Prof. Frank Wise at Cornell presents an alternative technique, named divided-pulse amplification, which appears to be most suitable for the domain of picosecond (or slightly sub-picosecond) pulses. The basic idea is to split pulses by sending them through a sequence of birefringent crystals, then to amplify them, and finally to recombine them in the same crystals or another set of crystals. With ten crystals, one would already achieve a 1024-fold reduction of peak power, thus substantially mitigating nonlinear effects. This approach indeed looks quite interesting. It is rather versatile, since it does not require very special optical components, nor any sensitive alignment (such as that of a dispersive compressor based on a pair of diffraction gratings). In the picosecond domain, one also does not suffer too much from chromatic dispersion. Particularly in conjunction with fiber amplifiers, the technique could constitute a practical solution of the nonlinear problem when generating millijoule-level pulses with durations of a few picoseconds. 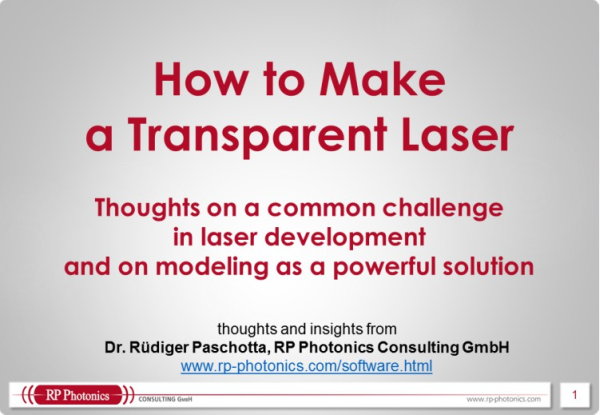 A new article in the Encyclopedia of Laser Physics and Technology explains and discusses the method more in detail.